I’ve always liked the idea of a hash; various bits of food all chopped up and cooked together. I tried to make a corned beef hash once which was somewhat eventful. I was at University in my student house with two of my friends. The can of corned beef was being somewhat stubborn so I used my intuition and tried to open the can with a can opener. Suffice to say there was some slippage and some slicing and next thing I know I’m running around the kitchen with all of us pretending to be braver than we are trying to wrap my hand in kitchen roll. Luckily we lived near the hospital so off we trudged, in the ice and snow, to sit in A&E with all the people who had dislocated something slipping on the ice. I ended up with four stitches and my two fingers bandaged up which provided much amusement for the following week. In my haste to leave the house I had left a pan of water on the hob; this was also the night I learned you can burn water. All the vegetables should be chopped to roughly the same size; I went for 1-2cm cubes. Boil the potatoes in salted water until tender, drain and put to one side. 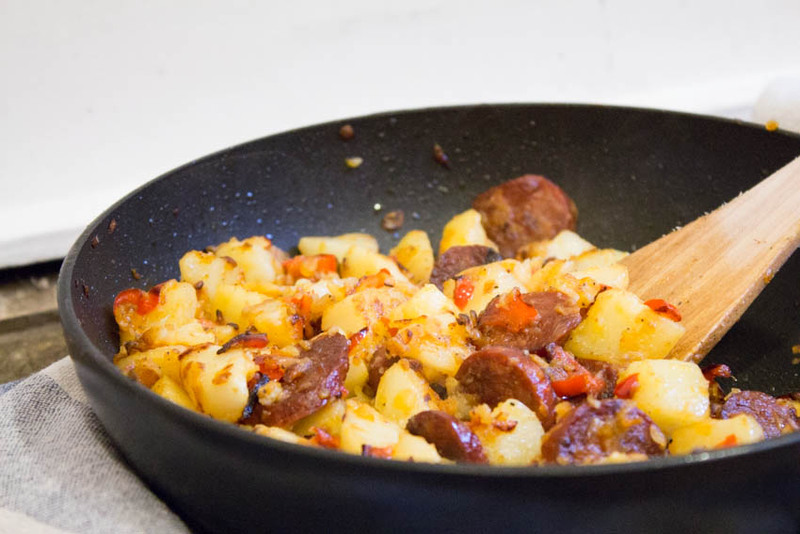 Heat a little oil in a large frying pan and add the chorizo. Cook until the oil starts to come out of the chorizo and it starts to get crispy. Remove the chorizo from the pan and put to one side. Drain off most of the oil from the chorizo but keep a little and return the pan to a medium heat. Add the onion and pepper to the pan and fry for around 10 minutes. Add the potatoes and garlic to the pan and fry until everything is golden. Add the chorizo back to the pan with a little salt and plenty of pepper. You can top the hash with a fried egg if you like too. As you can see I steered well clear of corned beef for this attempt at a hash and I managed to make it injury free. It was lovely; bright, vibrant and full of different flavours. I like that it’s all mixed together in the same pan; the dark, sticky, sometimes crispy onions are a real treat. Not too pricey, not hard to make and it uses up bits you might have hanging around anyway. Oh, and also, the aforementioned corned beef incident also taught me something else: my tetanus vaccinations were up to date. Every cloud. Simple dish and with potatoes as one of the ingredients, I’m full of admiration for it though beef is taboo for us. I love the look of this, I dislike corned beef greatly & it seems chorizo makes a suitable substitute. It looks hearty and loaded with flavours! Gosh this looks fantastic – a perfect comfort food! Those corned beef cans are a nightmare, do they still have those little keys, I wonder? We grew up on corned beef hash (with lashings of tomato ketchup) but I reckon I’d give your meal a go over that any day! i love a hash! 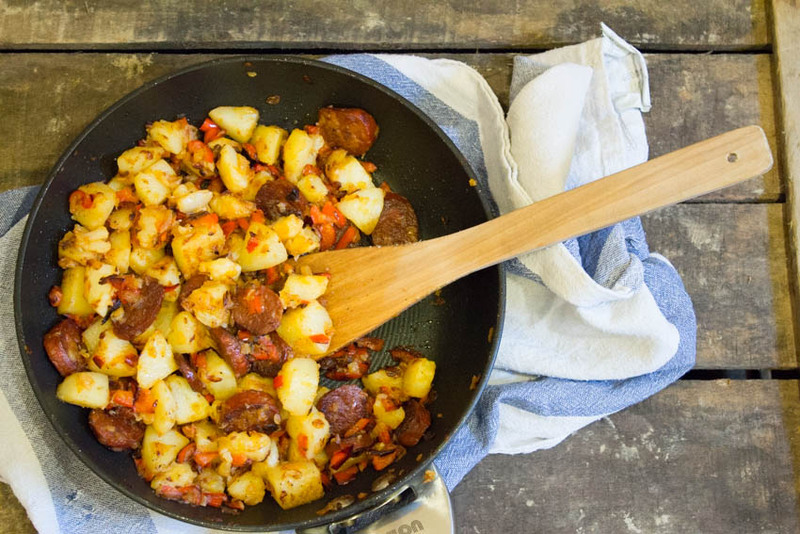 seems to me that you’ve done it up right, chorizo is a great addition! Love this dish… delicious for breakfast or lunch. Well that was quite eventful! Glad this hash came into the world without quite as much fanfare. Can’t beat a budget meal, this one looks fantastic. I made a near identical dish on Sunday. It’s a winner isn’t it? Hash can be such terrific stuff, can’t it? Never made one with chorizo, but you’ve got me interested — I’ll have to try it! Thanks so much.